Beautiful! Love these colors - I'm ready for fall and so are you! Awesome! I'm so going to do this today. I've been in a bit of a rut this week and this is just what the doctor ordered. Your tip is brilliant, BTW. I would never have thought of the template, have one, and would have tried eye-balling it and been unhappy. Gorgeous! Just a shame I'm on holiday and nowhere near my craft stuff! Can't wait to use the sketch! Ahhhhh....this sketch makes me feel so calm & serene! Ooooooo, I love your card!!! Thanks for another great sketch and for the inspiration to ink up my brand new Papertrey set in an autumn theme. 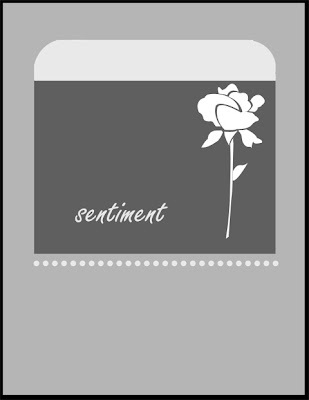 Gorgeous sample card!! Oooh your card is gorgeous - great sketch! beautiful! I featured you at Top Ten Creations! 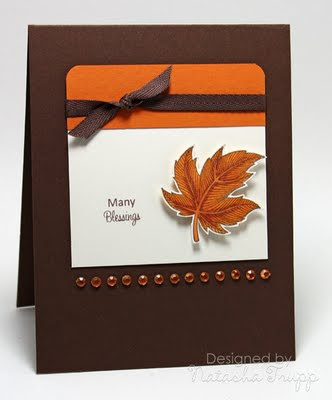 Love your gorgeous fall card! What rich colors. Great sketch, helped me to dig out my Bellas Bloom set that I haven't used in ages. I am sure to make more using this layout...inspiring! What a great sketch! Sorry it didn't come easy for you--it was so helpful to me! THANK YOU so much!! Love this week's sketch and will be back with my entry soon! Here is my MASKED HAPPY FALL Y'ALL card I made using this kewl layout. Hope you like it. What a fantastic sketch! Here's my card!! Love this sketch! I will be falling to it often, I think. Thank you for the great layout and fabulous inspiration! Here's mine! I did one last week and forgot to share! Thanks so much for consistently great sketches! I combined Sharon Johnson's ssnotime106 leaves and your sketch challenge into one card - here it is! Thanx for the great sketch! I loved this sketch when I first saw it. I finally got around to actually using it instead of just loving the way you made it look! I luv this sketch, well I luv all the sketches here....thanks!